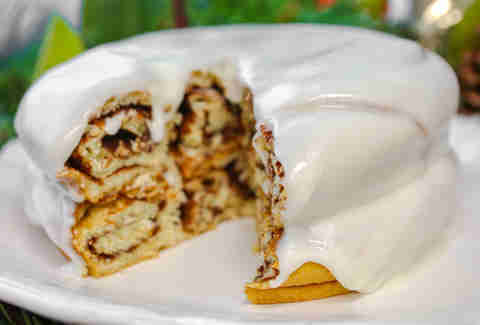 Cinnamon rolls -- just like pizzas, bagels, and cakes -- should always be big. Stupidly, borderline-disgustingly big. And while sticky spirals of sugar and spice the size of your fist are ubiquitous thanks to airports and suburban mall food courts, Sam's Club is unleashing a cinnamon roll that's -- dare we say it -- maybe too big. Maybe. The wholesale retailer first unveiled the supersize cinnamon roll on Wednesday as a family-size breakfast/dessert/treat for the holidays. 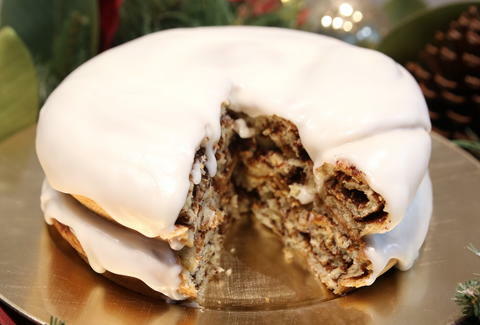 However, the colossal confection is more like a cake than a roll, weighing in at a whopping 44oz, or nearly 3lbs. For perspective, that's roughly five servings (approximately 268g, or 9.5oz) of a regular Cinnabon cinnamon roll. They're available at Sam's Club locations nationwide through December 31 for $5, according to a spokesperson. Sam's Club said the giant cinnamon rolls are made from a "special" recipe that includes several layers of cinnamon and enough icing to form a rich layer over its entire surface. As you can see in the photos (shown above), it appears to be best served in slices, but nothing's stopping you from attacking it with a your a fork, your fingers, or your face. Well, nothing besides your remaining dignity. If anything, it's a strong contender for the dish you bring to your family's holiday gatherings this year. Or stress-eat while you travel. Up to you. Tony Merevick is Senior News Editor at Thrillist and takes this as a challenge. Send news tips to news@thrillist.com and follow him on Twitter @tonymerevick.